And here we are again, sailing away from the beautiful island of Grenada. We had a short but intense stay and we felt very welcome there. The cargo hold has a wonderful smell of chocolate and cacao beans. Two days ago we were invited to visit the cacao plantations and the chocolate factory that produced the organic cacao beans and chocolate bars that we transport to the UK. The french television crew from the program Thalassa also went with us. It was surprising to discover what is actually behind a chocolate bar. I was expecting huge fields of little, well aligned plants burned by the sun like in a cotton field. What I found there was a little forest of cacao trees, growing amongst other plants and fruits with piles of orange and yellow cocoa fruits gathered on the ground that added patches of color to the scene. In the forest, groups of workers were opening the coca fruits using long machetes and emptying the beans in buckets before carrying them to the farm. The gestures were fast and precise. One of the workers was wearing an old Tres Hombres t-shirt. We also visited the farm itself, were the cocoa beans are set to ferment during nearly a week before being dried in the sun. 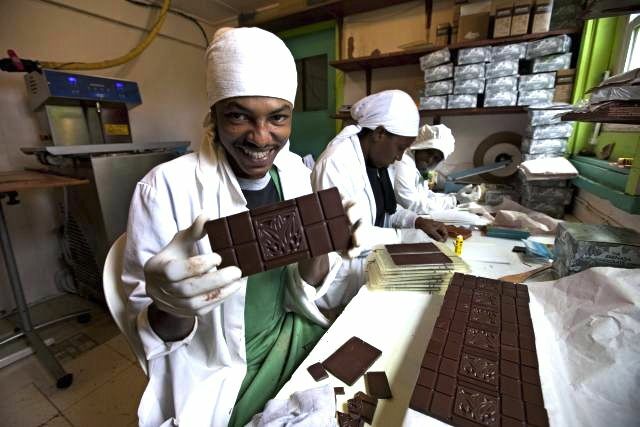 If they were to be exported, they would also be polished to look shinny and appealing for the market but since the foundation of the Grenada Chocolate Company, almost 15 years ago, the cocoa beans are processed just one mile away up the road. The chocolate factory is a little colorful house with just one floor and some solar panels in the garden. Belmond was waiting for us there. He had organized a meal and some drinks for us but the cooking had not started yet so we got to help in the preparation of the traditional dish and we lighted the fire to cook the vegetables. In the mean time Belmond gave tours of the factory. It is so small that we hardly fitted with five or six of us in the rooms. There are just a few machines there and a table to pack the chocolate bars. Of course we tasted all the different blends of chocolate and tasted them again and again ! Upstairs is an open room with the office and a balcony. An older lady is sitting there – she must be eighty years old – in front of a table filled with cocoa beans; she is sorting them out to remove damaged beans and remains of wood and stones from the plantation. In front of her, on the wall, a picture of the Tres Hombres under sail, and a portrait of Mott Green. He has been the initiator of this chocolate factory and everyone seems to know him on the island. Later she will tell to Arjen the story of the day Mott passed away two years ago, but her voice will become so low that I wont be able to follow. Yesterday was already time for loading the chocolate and leaving the island. As on our arrival, the Thalassa film crew was there with drones and cameras. Two of them are sailing along with us until Bonaire to make images on board. It is time to sail towards new adventures but we will come back to Grenada for more stories, more exchange and more chocolate !